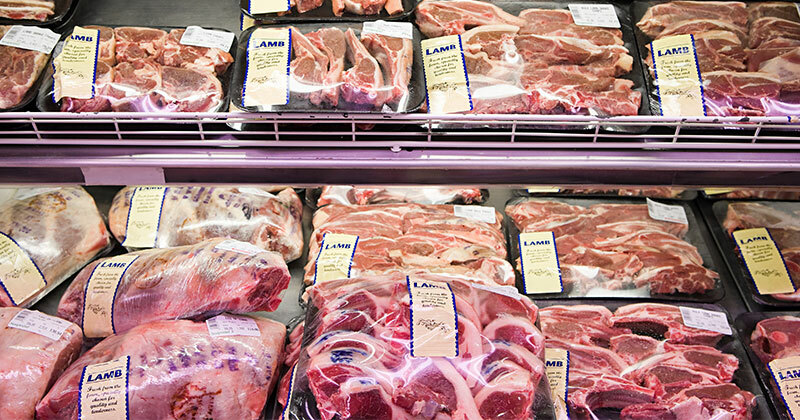 Coles and Woolies are already sprucing new spring lambs on their shelves, and we can see where they’re coming from with rising yarding levels in the south telling us the spring flush is making its move. This has already begun to take its effect on prices, with another week of declines for most lamb categories. Victorian lamb yarding’s are starting to show signs of the spring flush. September totals for Victoria are currently sitting at 5% above year-ago levels and this is providing a boost to east coast numbers. The total east coast yarding’s were 151,018 for the week. Although 17% lower than 2017, it’s still sitting 8% above the 5-year average for this time of year (Figure 1). The rising throughput is flowing through to affect the Eastern Indicators. The Eastern States Trade Lamb Indicator fell 19¢ on the week to see it at 773¢/kg cwt. Heavy lambs weren’t able to hold onto their levels for another week, posting a 35¢ drop to 783¢/kg cwt. Restockers were the exception to the falls, managing to finish the week slightly higher (4¢). There’s still a long way to go before we see these prices close in on last year figures. Mutton prices were again able to largely avoid the fate of lamb prices. The mutton indicator ended the week at 489¢/kg cwt, down just 2¢ on last week. The holding sheep prices in the face of declining lamb prices appears to be encouraging some supply forward. 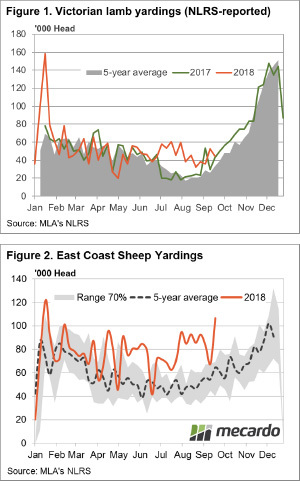 East coast sheep yarding’s have jumped a massive 57% higher in the last week, thanks to spikes in NSW and Vic (Figure 2). As covered in this week’s analysis article, we can’t see lamb supply matching last year’s levels through all of spring. This immediate rally in supply is likely to be mopped up relatively easily by processors. If supply does continue to increase due to dry conditions, there will be some pressure on prices, but this impact should be short-lived. The quid pro quo is that with available numbers more likely to be less than the 2017/18 season, tight slaughter supply is likely to maintain upward pressure on prices. The spring flush of supply could again have a limited corresponding decline in spring lamb prices, similar to the past two seasons.